Heat oven to 325°F (for all pans). Spray bottom and sides of 13x9-inch pan with baking spray with flour. In large bowl, beat cake mix, milk, vanilla, eggs and cream cheese with electric mixer on low speed 1 minute, then on medium speed 2 minutes, scraping bowl frequently; set aside. 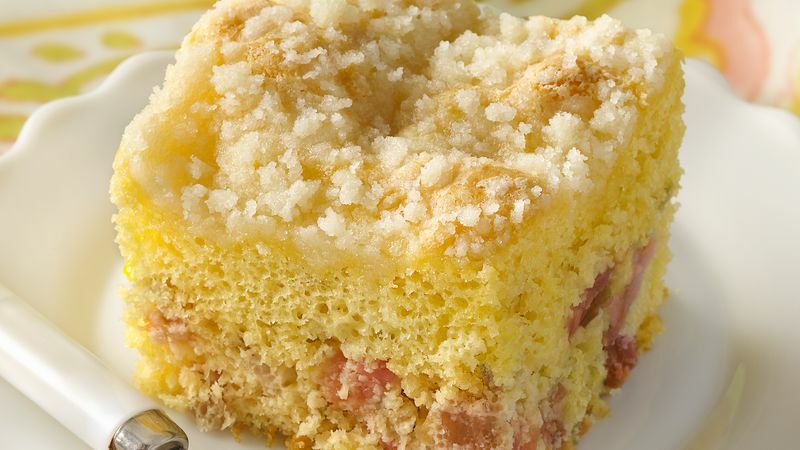 In medium bowl, toss rhubarb and 1/4 cup of the flour. Fold rhubarb into batter; spread in pan. In small bowl, mix remaining 1/4 cup flour, the sugar and butter until coarse crumbs form. Sprinkle over top of batter. Bake 35 to 42 minutes or until lightly browned and toothpick inserted in centre comes out clean. Cool about 30 minutes to serve warm or cool completely, about 1 hour 30 minutes. If using frozen rhubarb, measure the rhubarb while it's still frozen; then partially thaw and chop. Thaw it completely in a colander and drain but do not press out the liquid. Use a serrated knife to easily cut the cake, and dip it in hot water before cutting each piece.